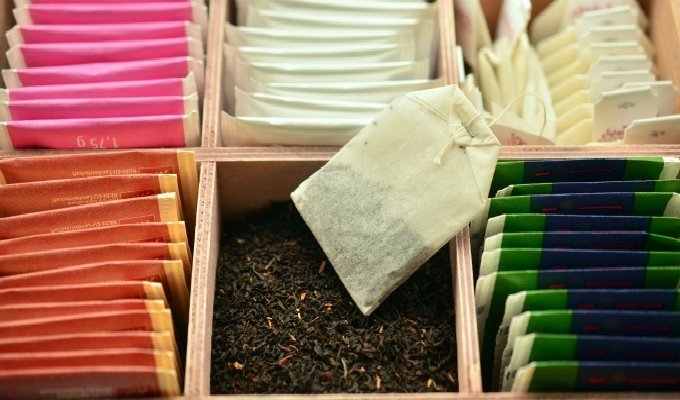 Edible Wild Food Blog » What’s In Your Tea Bag? Tea is the world’s most favourite beverage. In the UK alone, it is estimated that there are 165 million cups of tea brewed on a daily basis using tea bags. In Canada, Stats Canada says tea is the fifth most popular beverage with nearly 10 billion cups consumed every year. TeaUSA.com says on any given day over 158 million Americans drink tea; and in 2016 more than 3.8 billion gallons of tea was consumed in the US. Obviously there are many of us enjoying a nice brewed cup of tea using loose leaf plants; but there is not a doubt that millions worldwide are using pre-bagged tea. Have you ever given thought as to what a tea bag is actually made of? National Geographic has an interesting video about how tea bags are filled and made. According to this video, tea bags are typically made of manilla hemp,soft and hard fibres, and polypropylene. During the manufacturing process when tea leaves are placed on the tea bag fibre, heat is applied to the edges to seal the bags. This process allows the polypropylene to melt therefore sealing the bags. Polypropylene is considered one of the most versatile forms of plastic. It was invented in 1954 by Giulio Natta of Milan, Italy. Originally it was produced by the Italian chemical company Montecatini, and marketed under the name Moplen. Polypropylene can be found in kitchen utensils, rugs, car batteries, and in just about every market sector that uses plastics. For some reason this market sector includes items we ingest. The chemical and physical qualities of polypropylene combined with an attractive price have made it one of the protagonists in the food-packaging industry. Like other polymers, polypropylene tends to lose some of its constituents to the packed product, by migration, and when submitted to thermal, oxidative or radiation stresses it begins to degrade. These processes are of concern when food is packed in the plastic, for they can cause polypropylene to impart off-odour and off-taste to the packed product and in the worst case can give rise to toxicity of the food. Polypropylene is also found in reusable food storage containers, water bottles, mugs; rigid takeout containers; cutting boards, mixing bowls, baby bottles, sippy cups and in other kitchen accessories. On its own polypropylene doesn’t have many estrogenic properties. It’s the preservatives, dyes, and chemicals added to prevent it from breaking down. Preservatives such as BHA and BHT are often added to polypropylene plastics, and both have been shown to either mimic estrogen or interfere with the endocrine system. There is another foe lurking in many tea bags. Some tea bags are treated with a compound called epichlorohydrin, which is used to produce epoxy resins and acts as a pesticide. The National Institute for Occupational Safety and Health (NIOSH) labels it a potential carcinogen, and it’s been shown to cause cancer in animals, impair fertility, and weaken immune function. Tea bags, coffee filters, sausage casings, and water filters are also treated with epichlorohydrin. It can be argued that the amount of polypropylene and epichlorohydrin is so small that it can’t pose that much of a threat by having two or three teas a days. Perhaps this is true; however, add to this pesticides in the tea leaves, the pesticides in the foods you eat every day, GMO foods you may be consuming, health-compromising ingredients in processed foods, and for women more so, cosmetic products that have dangerous or questionable ingredients. Toss in those toxic household cleaners and chemical-laced air fresheners and that makes for a massive battle that our bodies must endure every day. It’s no wonder that many of us are falling into ill-health. Never before has it become as critical as it is now to become totally educated on absolutely everything we ingest, put on our body, and breathe in. What Tea Bag Brands Are Safe? CleanPlates.com has a great article in which they researched some companies about their teabags. It is well-worth reading. If you have a favourite brand of bagged tea then be sure to get in touch with them. If you simply want to check out various tea brands then it is advisable you go to your local store first and get a UPC number before you contact them. Most companies will not give you any information unless you have a UPC number. One company I can feel comfortable with purchasing their tea bags is Yogi. They provide a wealth of information on their website. Most of all, I am a huge proponent of loose leaf teas, and of course mostly foraged. When hitting the road I use muslin bags so I can re-use them two or three times throughout the day. Our bodies are under a mass amount of stress every day and the more we can do to lessen the chemical burden the better off we’ll be. Tea can nourish us, it can relax us, it can help to prevent cancer, it helps to destroy free radicals, hydrates our body, and a whole lot more. Have tea, lots of tea; but be sure to do your research on your favourite teas to ensure not only the bags are safe, but the tea leaves inside those bags too. Fibers from nettles, flax or cannabis (true canvas) would all make better healthy tea bags. Or skip the tea bag entirely and use a mate bombilla, strainer or Vietnamese Phin filter.